For 21st century mothers, there seem to be just two choices: be a Super Mom or be a Slacker Mom. One is bad for you; one is bad for your kids. So what's a momma to do? 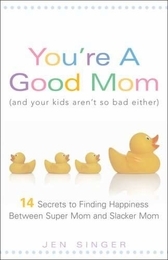 In You're a Good Mom (and Your Kids Aren't So Bad Either), the Internet's favorite momma, Jen Singer, tells all. Turns out you can raise perfectly good kids in that sweet spot between flash cards at breakfast and "donuts for dinner, kids!" It is for every mom who's pressured to be perfect yet lost under the laundry, wondering if she's a bad mom. It is for every mom who wants to enjoy--not endure--motherhood while still giving her kids what they truly need to succeed. Filled with "that happened to me, too!" stories and wrapped in the wit that could only come from the creator of Please Take My Children to Work Day, this book offers giggles and a pat on the back for today's moms, whether they're deep in diapers or petrified by puberty.